As I write this, my big-hearted daughter and her husband have just adopted another street dog, a small female mix breed named Maisie. The dog was dropped off at her home by a neighbor who purchased the dog at a flea market, kept it for a few weeks, and then realized she couldn’t manage a dog. She showed up at my daughter’s door and handed her the dog who was approximately a year old, unsprayed and in heat. The story of Maisie is unfortunately typical. An irresponsible breeder, someone who buys a dog on an impulse, and then gives it up because they can’t deal with it. . . and the dog is in heat. This is the kind of story that in our town and in the country frames the conversation about spaying and neutering. The squeamish may now skip this paragraph. Neutering (the generic term for both spaying and neutering) is the removal of the ovaries and uterus of female dogs and removal of the testicles of male dogs. Both are done surgically under general anesthesia. Okay guys, you may now uncross your legs. 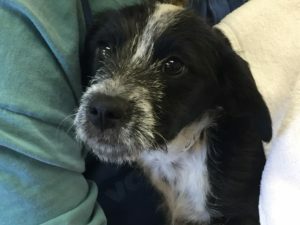 Twenty-eight years of neutering has made a significant impact on the unwanted dog population in Santa Fe. But what about you and your dog? Should you have him or her neutered? After all, there is research that points to health effects of early neutering of dogs, specifically some growth issues and some types of cancer. On the other hand, neutering also reduces the risk of some cancers. Then there are the behavioral aspects of unneutered animals. Growing up in a farming community in the sixties, we had an unneutered female German Shepherd (we loved our dogs, but we were not necessarily dog-smart). Our neighbors had an unneutered male, the infamous “Little Joe” who would find a way into our house anytime Shawnee was in heat. Testosterone drives unneutered male dogs. They can become aggressive, they will become escape artists (especially when there is a female dog somewhere nearby in heat), and they will go through screen doors to get to that same female. Exhibit A: Little Joe. Female unneutered dogs go into heat that can last up to a month and happens twice a year. During heat, a female dog needs to be isolated from male dogs otherwise they will get pregnant. Trust me! For your dog it comes down to this. If you are a responsible dog owner, maybe you can delay getting your puppy neutered until they are six months or until the female has gone through two cycles of heat. Maybe you could defer getting your dog neutered at all. But— and it is a very serious caution — it depends on your definition of responsible. Can you absolutely, positively assure that you will not cause a female to get pregnant? That is a high bar when you are dealing with testosterone driven males and females in heat. Dr. Murt suggested that one alternative was good dog control and a leash. Here I beg to differ. I was a twelve-year-old skinny kid with an eighty-pound female German Shepherd on a leash trying to keep her away from Little Joe. It made no difference. The only thing that changed was I was witness to something I never wanted to see. The result was ten puppies. To sum up, I consider myself now to be a relatively responsible dog owner (with a few noted big slip-ups), but we will continue to have all our canine partners neutered. It is just the right thing to do. The shelters will continue to neuter the animals that come through before they are adopted. That is the ethically correct thing to do. And about Maisie, my daughter’s new dog? She has an appointment to at the Shelter to be neutered in next week.